United Airlines have copped serious backlash across social media due to the “forcible removal” of a passenger on Sunday night. Since then, the video of the incident has gone viral and resulted in the trending of hashtag #newunitedairlinesmotto. 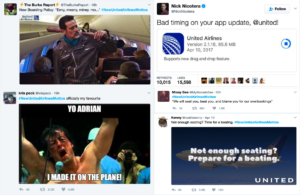 The public has taken to social media platforms such as Twitter to condemn United Airlines and create their own submissions for replacing the airlines “fly the friendly skies” advertising tag. The hashtag #UnitedForcesPassengerOffPlane was the top trending item on Sina Weibo, which is considered the Chinese equivalent of Twitter – with over 270 million views. But investors were not laughing. United Continental Holdings has seen some $255 million cut from its capitalisation which stands now at around $22.246 billion, from 22.501 billion at the close on Monday, according to FactSet data. What has this meant for their own social following? 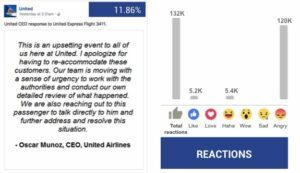 Their Engagement went through the roof on Tuesday 11th, due primarily to the page posting CEO, Oscar Munoz’s, response to the incident. The post garnered 123.5K interactions and a whopping 11.86% Engagement Rate – but it certainly was not all good. What was perhaps most surprising, was United Airline’s absence from communicating with their customers. Rather, as can be seen in the above comments, attempting to monitor them by selectively deleting comments.